For Whom Tolls the Bell? In an inversion of the closing of Tsipras’ op-ed in Le Monde, we might ask: Does the bell really toll for Europe, or just for Greece? The game of the new Greek bailout so far is playing itself out as predicted in my last blog post. The “chicken” parties are starting to swerve a little, and as you might expect, when one swerves the other comes back on the road to menace the first. What is more disconcerting is that both sides seem to have lost the plot of what this is about. The European institutions think in peripheral categories within which a sustainable solution will never be found, successfully dragging Greece into a ‘technical discussion’ where no-one gets the bigger picture any more. That is but a tactical win for the institutions, as Greece and the world want and need a big picture approach. But Greece is getting distracted by the detail floating around between the technical teams. Take Hollande as an example: saying “we must replace those details that Greece cannot accept” is a strong statement indicating the will for a solution. Yet the language betrays a strategy of self-deception, suggesting that the devil is in the detail when the only two red lines are clear for everyone to see: pensions and real debt relief. They require rather more than a compromise on technical details, and I think Tsipras is right in saying that they go to the heart of what Europe stands for. The bell tolls for Europe, if Greece doesn’t compromise, and it tolls for Europe, even if it does. The Greek problem is universal. Greece will have been first to demonstrate that the consensus on public debt sustainability is in itself unsustainable given the backdrop of current demographics, and with the legacy of the Euopean social democracies of the 70’s and 80’s, but it won’t be the last example. That privilege will probably go to France, in a couple of decades at the latest. By then the bell will have tolled for all Eurozone countries, rich and poor. the institutions assume that, as with previous Greek governments, offering to roll over debt is a bargaining chip that makes the Greeks pliant. This was not the way Syriza saw things, but the institutions are pretending it’s still true. The Greek government, once they accept being bankrolled by fresh debt, will have accepted the very logic which they claimed to be a perversion. Their job, when they got elected, was to make everyone stop pretending Greece isn’t bust and to go cap in hand asking for a new deal which could only involve forgiveness of sorts, with the real joker up their sleeves being the threat of default. They got elected to call the bluff that is the pretense that Greece will do anything just be lent fresh money, to avoid default on a pure technicality. Making Greece borrow more and save more is akin to flogging a dead horse, with huge social and political costs. The second disconnect is about whether the Greek public can take more pain. Again the institutions are in denial. Greece’s public can’t take more pain in the short run. Not because it’s theoretically impossible, but because it’s politically stupid, until at least some people in Greece have seen some upside from all the sacrifices they have already made. It’s growth that needs to bail out the EU’s story on the ground in Athens, and growth isn’t forthcoming. There has to be a carrot at some point, and with a new government Greeks know a sign of hope either comes now, or not for a very long time. If there is no hope of redemption, the country will be lost to Europe. Tsipras should at least threaten elections before signing any new debt roll-overs. That’ll go down really well in Europe (remember when George Papandreou tried this trick in 2011 and was unceremoniously removed? ), but what choice does he have? I have read both documents, the EU 7-pager, and the Greek 47-pager. The only real disconnect between them is in the sustainability of the refinancing/debt restructuring, and in the pensions reform. The rest is a whole lot of detail where the documents either agree or Greece goes way beyond the call of duty (to the extent of being ridiculous: Amongst other things, they are talking about Gynmasiums, Business Centers and Tourist Buses for heavens’ sake! No-one asked for that. Get focus, please! In spite of its rather contrite conclusion, the main body of Varoufakis blog post on Project Syndicate, called “A Speech of Hope For Greece” makes the nectral point in the whole process: To get Greece out of its misery, it needs support for an effort that is almost as difficult as nation-building itself, a reconstruction not unlike that which Germany went through after WWII. Greece needs a regime-switch, not in the sense of a leadership change, but in the sense of a psychological transition, a paradigm shift in people’s understanding of ‘polis’ (should be no problem for a Greek speaker) and citizenship: it’s as fundamental as turning ice into water: It requires (a) the right environment so that (b) every molecule plays its part. The paradigm shift needs to touch the life and mind of the vast majority on the ground: from a regime where not cheating would make you the last remaining idiot who pays for everybody else to a regime where responsibility and citizenship are again seen as civic duties and enforced not so much by the institutions than by new social norms. That paradigm shift cannot happen without a crisis, but it also cannot happen without hope. Germany knows this better than most, as it collectively underwent an even more epochal paradigm shift after losing WWII. It could have been blamed for a lot of things back then and gotten a bad rap and made to pay for a lot of bad stuff. (as it did, after WWI !). ManyGermans were ready to not repeat the same mistakes twice. The regime in their head needed to change, collectively, and it happened because, unlike after WWI, Germany was given moral and financial support, allowing it to come back stronger, gain self-respect quickly and against huge odds, and become an integral part of Europe’s peaceful future. It had been handed it’s existential crisis, and it had been given hope from outside. It wasn’t stuffed with another Treaty of Versailles. The point we learn from comparing post-WWI Germany to post-WWII Germany is that sometimes nations have to forgive, help out, and move on, no matter how hard it seems at the time; Or get stuck in a rut that is inescapable and forever destructive. In this context, I think it is pertinent to remember that the Marshall plan consisted to 90% of grants, and only to 10% of loans. And also, that the Treaty of Versailles was blamed by John Maynard Keynes and others for causing the mood in Germany which made WWII a possibility, leading that very same man to push against reparations after WWII, which, as he observed, were in any case paid by additional debts from the US, leaving no-one better off. But alas, Varoufakis’ plea for a speech of hope for Greece will remain unheeded and all eyes are still on the ‘negotiations’. We are attacking the Greek problem with the minds that drafted the Treaty of Versailles, and not the minds that came up with the Marshall Plan or the Berlin Airlift. We have picked a game where there needs to be a loser.And then? What have we gained? Greece will (probably, and wrongly; more on that below) give in at the negotiating table, but Europe will have scored an own goal. Cheap points at the expense of a sustainable solution, of the truth, and of future generations of Greeks and a workable currency union that doesn’t have divergence programmed into it. That is what Syriza is saying, and it would be wrong to shoot the first party that actually (a) has some legitimacy and (b) calls a spade a spade. The fact that they are left-wing, politically inexperienced, and arrogant may make it tempting to teach them a lesson, but let me calmly ask again: And then what? The final point for all to consider is that Greece actually and truly does not have to concede at all. I think it truly has (and always had) the option to default, and leave the question of Grexit for the EU to decide independently. Because, and mark my words, there is no way the EU will force a Grexit. To understand that, let’s think through how a default would likely play itself out. I live and travel a lot in the wider region of South-East Europe, and I can tell you there is no way the EU can afford to lose Greece as a spearhead of many good things (call them ‘European ideals’) in the Balkans. Not even after the debt debacle. If Greece defaults, it will not be pushed out of the EU, because the alternative has unthinkable consequences in the demonstrably volatile Balkans. Next question therefore: will it stay in the Eurozone? Note that Currency Substitution, whereby countries use an official currency which they don’t control at all (in effect ‘not bothering’ to issue their own), is a reality in many small countries. No country can strictly be forced to issue its own currency. But currency substitution comes at a cost: (a) you can’t employ a monetary policy to keep the economy, inflation, etc. on a steady path, (b) you can’t ‘print money’ to pay back old and bad debts (as was customary in the wider region before the currency union) and (c) you can’t bail out the banks or anyone else in a crisis unless you have a very high credit rating. But all of these conditions, which can become break points for currency substituting regimes, are manageable: (a) you won’t need a monetary policy where elastic debt relief can fulfil the same role, (b) you don’t have to print money if you can pay back what’s due because of other aid, and (c) banks can (and most probably will) be bailed out by the Europe’s public sector (the ECB, or the ESF), perhaps associated with a retail-deposit haircut a la Cyprus. Greece then has no incentive to leave the Euro and print drachmas, and no-one will force them. Only a complete collapse of the Greek banking system would force adoption of a separate currency (which is in effect a legislative act, re-denominating bank balance sheets in new funny money so they can keep going). Whose interest would be served by allowing that to happen? As Wolfgang Muenchau from the FT proposed, the Greek banks could (and probably would) be taken over by the public sector outside Greece. Greece may have to implement currency controls, but will only be too happy to oblige (as did Iceland and Cyprus when their banks were practically finished). Currency substitution would take place and would work. Technocrats would point out that the other European central banks would have to write off balance-of-payment credits from the central bank of Greece. That is true, and it is a design flaw in the Euro that the US Dollar does not have (there, the various Ferderal Reserve Banks actually settle their ‘inter-Feds’ claims periodically). However, this would also be true in a Grexit, so this problem does not weigh on the Grexit-probability. On balance therefore, a default without Grexit is preferable for all parties compared to a Grexit, and the Greek government should know that. A default would just be a unilateral act of taking what Greece needs, which is recognition that it can’t pay and acceptance that it won’t. And it is in this rather large detail where the real suspense of the situation resides. Do both sides know, and do both sides know that the other side knows, that default is an option because it cannot rationally be followed by Grexit? For the institutions: (1) Do they play on with the same game of pushing successive Greek governments into concessions that have little local buy-in because they are seen as ‘foreign intrusion’ and right-wing orthodoxy (producing ever-more polarised election outcomes)? Keep bankrolling old debt with new debt, only deferring the inevitable while risking political and/or social instability in Greece? Or (2) do they make an offer of actual aid or write-offs in exchange for constructive change in the legal, penal, tax, and administrative system? For Greece: (i) Does Greece accept further loans to stay afloat, meaning the game will repeat itself over and over, and next time they’ll find it much harder to argue that this is nuts, or (ii) do they call a spade a spade and default if real debt forgiveness is not offered? The rational choice for Europe is that the institutions offer a long-term sustainable split between outright grants and rollover loans, so that everyone can credibly claim the future loan burden is sustainable and defensible. This is even more the case if they know that Greece knows that default is a real option. But the IMF and the ECB don’t have the mandate for debt relief, and the EU does not have the time to get this through the local parliaments! If the institutions pull off this option (2), Greeks can say “thank you” and start to rebuild with foreign help. With the right carrot and real goodwill I believe the Greeks are as ready as the Germans 70 years ago were, not to repeat their past mistakes. Greece’s rational response to action (1) by the institutions. however, must be to default. It would have been rational in 2010 and again in 2012, and it is even more rational now. But on the Greek side too, it is questionable whether they know it’s even an option: I doubt the new government will have the guts or indeed believe they have the mandate. Most likely this government, like the ones before it, will be beaten into submission over details that are at best meaningless, at worst even more harmful than an already unsustainable current situation. Interestingly then, and frustratingly, it looks like both sides are setting themselves up for making the wrong move, based on the wrong hypothesis: We will end up with another ‘memorandum’, another debt roll-over, and another bunch of forecasts which are unsustainable, will be broken, and break the camel’s back a third time before it even had a chance to get up, simply because everyone believes (and believes that the other side also believes) that default is not an option. Having a new government with a new mandate and the courage to call a spade a spade will have been a lost, one-off opportunity for everyone to come clean on their faulty assumptions. I hope that Europe will switch to a message of aid and hope, and find the time to credibly put it together, giving Greece a chance to heal not only financially but also to create the social cohesion within Greece and within Europe that is necessary to create a new social contract where the concept of citizenship entails the right balance between entitlement and duty (something which I think was lost all over Europe in the social ‘hand-outs’ democracies in the 70ies, and 80ies). The rest of Europe will have to undergo that same challenge in the next decades if sovereign debt is to be sustainable in Italy, Spain, and France. We need to fundamentally re-educate our entitlement-generations. Greece got the dubious honour of having to be a first mover on this. The discussions that the deadlines be extended until March 2016 gives some hope, but I’m not holding my breath. Should that not happen, and Europe just puts forward a take-it-or-leave-it roll-over proposal at some point, I hope Greece has the courage to actually walk away from the deal and default. Greece could even put in its constitution an amendment never to borrow again. In this way, Greece might yet become the forerunner of future sustainability of government finances in the age of demographic inversion. But it has to refuse to play the role of the to-be-punished child that was imposed so successfully on inter-war Germany and on previous Greek governments. 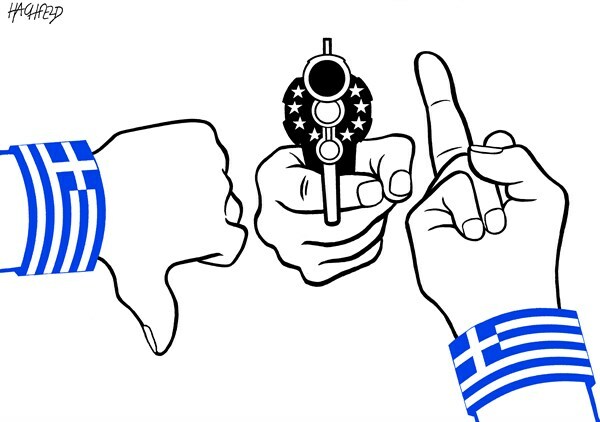 Varoufakis is famous for the line (on YouTube) “and stick the finger to Germany”. The time for his promise to be made good may be approaching. Say “we won’t pay, and we won’t borrow. Not now, and not in the future either”. Default only hurts the defaulter when they ask for money later, and the effect will be similar (albeit a lot more hostile) to true but voluntary debt relief. Societies don’t get healthier when they allow themselves to be punished by outsiders, even if the punishment is fair. We should all have learned that by now. Whether we like it or not, the time to give Greece a chance is now and not next time. Love them or hate them, but if you humiliate this government too into submission, you may get some satisfaction out of shooting a perhaps rude and cocky left-wing messenger, but you will also have lost a historic opportunity. Focus your minds on this: Default is a real option. Default or new elections are the only rational choices if Greece is cornered. This is no time for chit-chat, for detail, denial, posturing, or for personal pride. This is the time to stop the financial engineering and step up to the plate and bail out a family member if you want to buttress the very foundations of political cohesion. This opportunity won’t come again in a hurry, if at all. Excellent article Karl.. ..Why don’t the main stream media report the Greek debacle as such. Great article Mr Strobl. I wish you decided to share this opinion with the general public in Greece. I have no problem deciding that, but what is the best route? do you wish to translate? Yes, I would be willing to do that. With your help of course in explaining a couple of parts that still seem a bit unclear to me.